Oral arguments in King v. Burwell: Silliness and bombast as the Supreme Court considers Obamacare. Scalia and Kagan are feisty; Kennedy gives hope to people who care about affordable care. 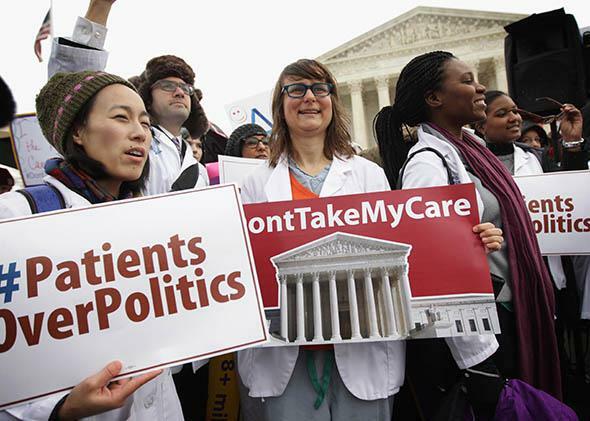 Supporters of the Affordable Care Act gather in front of the U.S Supreme Court during a rally March 4, 2015 in Washington, D.C. When the Supreme Court last heard oral argument on the Affordable Care Act, in NFIB v. Sebelius, arguments stretched over three long days, protesters were bused in to holler at each other, and questions about whether Congress could fix a law if it wanted to were not met by derisive laughter. But a lot has changed in a few short years, and—as oral argument begins in King v. Burwell—the sense in and around the court building is that this time, the case is both sillier and more consequential than it was last time. The appeal is a statutory interpretation case, not a glamorous constitutional one, and the principal argument is whether four errant words in the Affordable Care Act prohibit tax subsidies in any state in which the federal government, as opposed to the state itself, runs the insurance marketplaces or “exchanges” required under the law. If the four Virginia petitioners in this case prevail with this claim, more than 8 million people (and probably many more) will likely lose access to health insurance, with life-threatening consequences for some of them. The cost of insurance would skyrocket, leading to a so-called “death spiral” which may undermine the very object of the ACA: affordable care. If the government wins, on the other hand, everything about the ACA would remain the same, and some disgruntled people (who, as it turns out, are actually quite hard to find) might have to use federal tax credits to purchase their unwanted affordable care. The morning at the Supreme Court starts as any good morning must: Paul Ryan’s newspaper is confiscated by the marshals inside the courtroom, and he is forced to sit silently looking at the statuary like the rest of us. This is practice for silently looking at the statute, which is how we will spend the remainder of the morning. Michael Carvin, who represents the four Virginia plaintiffs in this case, opens by explaining: “This is a straightforward case of statutory construction where the plain language of the statute dictates the result.” Justice Ruth Bader Ginsburg stops him to ask whether any of the four plaintiffs in the case actually have standing to challenge the ACA, an issue raised recently in reports from Mother Jones and the Wall Street Journal. Carvin reassures her that at least one of the plaintiffs does have standing, since he is ineligible for Veterans Administration benefits, because he only served 10 months. Then Carvin turns to his main argument: that the plain meaning of four words in Section 36(B) of the Act—“established by the states”—can more or less eat the face off the rest of the 900-plus–page law. When Carvin replies that “the key point is that Congress was not agnostic as to whether states or [the Department of Health and Human Services] established the exchange,” Kagan thanks him for pointing out that his answer to her question depends on “context” and on the intent of the law as a whole. Now Carvin is sort of famous at the court as a tough guy, who sometimes punctuates his oral arguments with a silent but somehow discernible “you dope.” Kagan, moreso Wednesday than ever, seems to be raising his unspoken “you dope” and seeing him a barely restrained “duh.” It’s pretty rare to see this level of both bombast and condescension in the high court, but this case seems to invite it. Kagan can’t understand how the statute can work under Carvin’s reading of it: “You would be setting up an exchange with no customers and no products” if the federal exchanges could not sell insurance that is subsidized. Justice Anthony Kennedy jumps in to add that “from the standpoint of the dynamics of federalism, it does seem to me that there is something very powerful to the point that if your argument is accepted, the states are being told either create your own exchange, or we’ll send your insurance market into a death spiral.” He adds that, “It seems to me that under your argument, perhaps you will prevail in the plain words of the statute, but there’s a serious constitutional problem if we adopt your argument.” And across the courtroom, progressives pee just a little in joy. Carvin replies that, “The government’s never made that argument.” (It has been made in the supplemental briefs and the press.) To which Kennedy retorts, “Sometimes we think of things the government doesn’t.” And the government pees a little. Kennedy may be in play. Sotomayor then asks: “Do you really believe that states fully understood that their citizens were not going to get subsidies if they let the federal government? What senator said that during the hearings?” Carvin replies: “The same amount of senators who said that subsidies were available on HHS exchanges. Which is none.” The degree to which one must reverse-engineer congressional history to support this narrative would violate even Captain Kirk’s directives on messing with the past. Still, Carvin’s going for it. Carvin replies, “Well, if you’re going to ruin my 10 minutes.” Which Kagan promptly does, by asking why nobody seemed to know that Carvin’s reading of the statute was even coming. “I mean, this took a year and a half for anybody to even notice this language.” Kagan and Carvin proceed to pound on one another some more. Contemplating the catastrophic real-life outcomes that could happen if the petitioners lose—which nobody seems to want to talk about—Alito posits that “it’s not too late for a state to establish an exchange if we were to adopt petitioners’ interpretation of the statute.” Verrilli replies that, “In order to have an exchange approved and insurance policies on the exchange ready for the 2016 year, those approvals have to occur by May of 2015.” So, yes, it’s too late. Alito wonders if the states could be given extra time. Now, this is as good a time as any to tell you that the U.S. Solicitor General has a very serious case of what I call “C-Is-for-Cookie Hand” which is a disease occurring chiefly in legal academia that involves putting the fingers of the left hand into an enormous C formation and waggling the wrist to make some sublime legal point. At this juncture I am so mesmerized by Verrilli’s C-Is-for-Cookie Hand that I do not hear his answer to this question. Verrilli is mighty confident of his text-and-meaning argument, that C-is-for-Cookie-Handed solicitor general. And so we end without having talked much Wednesday about the millions of people who may suffer if petitioners win, except insofar as there is abundant confidence in some quarters that either Congress or the states would never let that happen. Even the justices who side with Carvin concede that there may be catastrophic consequences. One has to travel pretty far down the legal rabbit hole to read this statute the way petitioners do, or to find contemporaneous history to support it. But rest assured that way down in that rabbit hole—and perhaps only there—state exchanges get set up in six months, Congress gladly tweaks Obamacare, and states that all-but changed their state motto to “Hating on Obamacare since 2010” joyfully jump on the bandwagon. The ACA may still survive life in the rabbit hole, but if argument is any kind of predictor, it may be because repairing an affront to the dignity of states, not people, is always imperative.